Harvest Automation robots are designed to work around the clock, they never need a break, and can handle the most tedious and repetitive work on a Nursery or Greenhouse operation with consistent accuracy and on-time performance. Starting in the 16 th century, Poinsettias, with their beautiful bright red flowers or bracts and intense green canopy have been associated with the Christmas holiday season. Today, the Poinsettia is the best- selling potted plant in North America with annual volumes of approximately 65 million units in North America alone, 90% of which are sold in the 6 weeks before Christmas. 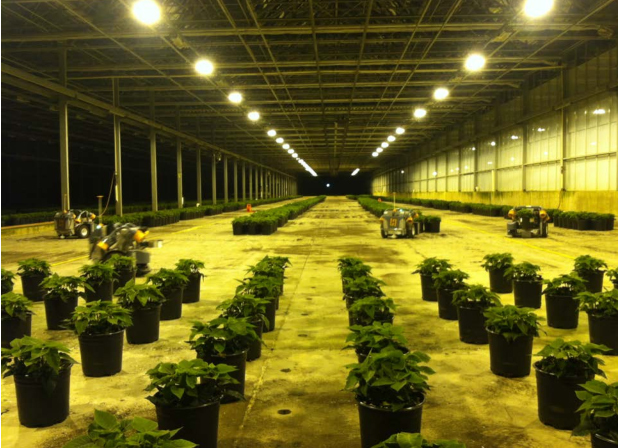 Metrolina Greenhouses in Huntersville North Carolina, is a major producer of Poinsettias with tens of thousands sold to big box retailers up and down the east coast. In 1972 Metrolina Greenhouses was founded by Tom and Vickie VanWingerden who immigrated to the US from The Netherlands. They moved to Charlotte, NC in the spring and soon moved the company to its current headquarters in Huntersville, NC where they bought an 80 acre tract of land. During the first 10 years of existence, the business was mainly spring, April 1st through Mother’s Day, and Poinsettias for the Christmas season. The 1980’s was the era of automation for Metrolina. They asked “How do we do tasks faster, at a lower cost, and minimize physical labor?” Tom VanWingerden was a naturally gifted engineer and was crucial in developing much of the automation that has enabled Metrolina to succeed. By 1996 Metrolina had grown to a size of 50 acres. During this time they introduced a moving table system in to their greenhouse to minimize strenuous labor. During the 2000’s, Metrolina placed more emphasis on marketing and packaging. They started to learn what the consumer wanted and developed whole programs around that. During the last 10 years, they have seen growth from 50 acres to 150 acres of greenhouse and production space. It was in the spirit of increasing productivity and improving the working conditions of their employees that Harvest Automation attracted the attention of the Metrolina team. 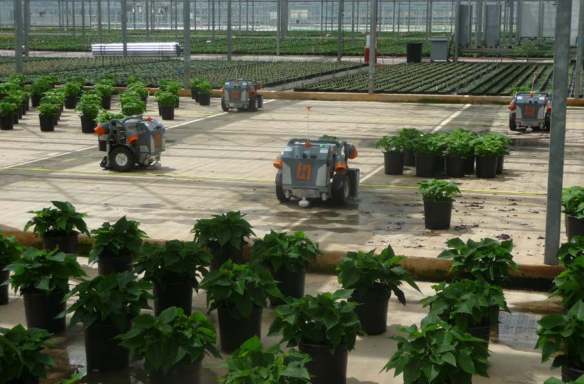 Harvest Automation HV-100 robots are capable of handling all of the plant spacing, consolidation and collection needs in a Nursery or Greenhouse operation. They require minimal training to operate, while reducing production costs and improving productivity. They are flexible to deploy on open beds, hoop houses and greenhouses with any type of plant on all common ground surfaces including concrete, ground cloth, poly, and gravel. The robots provide consistent spacing accuracy no matter how long the day is, without breaks, allowing growers to get quality work done whenever they need it. Even during crunch time, when nursery and greenhouse spacing needs reach a peak, the HV-100s can get the work done. Harvest Automation robots are designed to work around the clock, they never need a break, and can handle the most tedious and repetitive work on a Nursery or Greenhouse operation with consistent accuracy and on-time performance. For more information about Metrolina Greenhouses please visit http://www.metrolinagreenhouses.com/. Harvest Automation is a startup material handling company headquartered outside Boston, Massachusetts — an area known for robotics innovation. Our team members are industry recognized leaders in robotics and new product development with a track record of developing cutting-edge technology products and successfully bringing them to market. Our robots operate safely and efficiently in teams with human workers — a dramatic innovation in the world of manual labor. Harvest's robots resolve acute manual labor problems across multiple industries, starting with Agriculture. In many industry sectors labor availability, changing labor laws, and tightening environmental regulations are simply unsustainable. These fundamental risks and cost pressures are driving a critical need for automation.